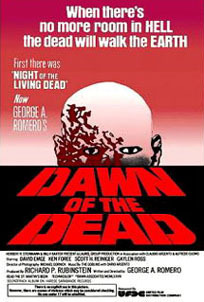 Dawn of the Dead was George A. Romero's epic sequel to his 1968 classic Night of the Living Dead. Released a decade after the first film, Dawn would prove to be a huge influence on the genre, in terms of special effects and the way onscreen violence was presented. It was the horror equivalent of The Wild Bunch. Dario Argento was one of the producers...and both he and Romero were excited about collaborating, as they had been fans of each other's work. Argento was also responsible for developing the score with Goblin, the group that had composed and performed the music so memorably for several of his own films. Add to this mix the sensational, over-the-top special make-up effects by Tom Savini - and you have what many consider a masterpiece. At WGON, a TV station in Philadelphia, pandemonium has broken out. Amidst reports that zombies are on the loose and attacking people (events which began in Night of the Living Dead), the crew wonders whether they will be able to stay on the air. An official is live on the air, arguing with the show's host about what is occuring. He claims his warnings about the dead coming back to life were ignored. Station Manager Francine (Gaylen Ross) is frantic, as she struggles to give viewers information about rescue stations that have been set up around the country - and that are quickly dwindling. Reluctant at first, she accepts an offer from her boyfriend Stephen (David Emge) to meet at a helicopter on the roof of the station later in the evening. Stephen is WGON's traffic reporter. The taping of the show continues as the official claims the undead are killing for food and are eating their victims. The only way to get rid of them is to shoot at their brains...or somehow sever the brains from their bodies. He adds that martial law has been declared in Philadelphia and around the United States. In one of the poorer sections of the city, a SWAT team descends on a housing project in which the tenants have been taken hostage by a group of thugs. After a violent shootout, the SWAT officers enter the building. Wooley (James Baffico), the overzealous and racist head of the team, goes haywire and fires at everyone in sight. As he is about to enter one of the apartments, he's shot down by one of his own men. Inside, the floor is littered with human body parts. Grey-faced zombies are roaming around and several are dispatched with shots to the head. In the stairwell, a young Latino woman recognizes a neighbor and runs towards him. She embraces the man...but he takes a bite out of her neck and arm. Blood is spurting everywhere and the zombie is shot dead. The mayhem is too much for one of the young officers, who sticks a gun in his own mouth and fires. A member of Wooley's unit named Roger (Scott H. Reiniger), goes down into the basement for a break. Peter (Ken Foree) finds him there and they talk about escaping on Stephen's helicopter. An old priest with a leg missing (Jesse Del Gre), walks in and tells them he's given the last rites to a group of undead in another room in the cellar. He warns the officers that the zombies will become stronger and overtake the living. Peter and Roger find the room and witness a gruesome sight...a group of zombies sitting on the floor, eating human flesh and body parts. Roger says he suspects the people who live in the building put them in the basement because "they still believe there's respect in dying." He and Peter shoot the zombies to put them out of their misery. They meet up with Stephen and Francine at the helicopter and take off into the night, uncertain about their future. By the morning, the four are able to see that the epidemic is spreading. In a field, a large group of people (whom Stephen refers to as "rednecks") are engaging in a turkey shoot with the zombies in the area. They're having a grand old time as they drink, pose for photos...and take shots at the undead. The four friends land the helicopter near a gas station to fuel up. Stephen is attacked by two zombies, one of which he subdues with a hammer to its head. Very quickly, they're descended upon from all sides, including by two small children. One of the undead comes too close to the blades of the chopper and gets the the top of his head sliced off. The group finally land the helicopter on the roof of a huge shopping mall. Francine wonders why the zombies have come there. Stephen gives her an incisive answer. He tells her it's instinct...memory...what they used to do. "This was an important place in their lives," he says. Peter breaks through a window and lowers himself into the complex, with the other three right behind. They find a room to hide out in - but Peter and Roger get the urge to branch out into the mall for necessities. Francine is against the idea and stays behind with Stephen. Down a long corridor, Peter and Roger discover the security and control room...where they turn on the escalators, exhibits, fountains - and even some muzak. The two then have a field day in the shops, filling a toy wagon with items. They lure the zombies to one side of a store so they can make their way back to safety. Roger is set upon by one of them...but manages to impale a screwdriver through his ear. Stephen worries about his friends and leaves Francine to join them. He ends up in the basement and is pursued by a lone zombie. He is almost unable to load his gun in time and just barely manages to shoot his attacker in the head. Other zombies follow but Peter saves Stephen in the nick of time. Together with Roger, they dash through one of the department stores to get back to Francine. They realize they can get around by going up an elevator shaft and through the heating ducts. While waiting patiently in the stairwell, Francine notices a zombie coming up the stairs. She tries to barricade herself in one of the rooms - but the zombie pushes his way in. Francine fends him off with a flare until the other three arrive. She's shaken up...but Stephen tries to tell her that they "have it made" in the mall. For now. Roger notices that Francine looks sick and Stephen tells him she's pregnant. Francine says she doesn't want to be treated differently because of her condition...and asks to be left with a gun when the men go off again. On a television, we see a scientist describe the zombie situation. He claims they are not cannibals because they don't feed on each other...they feed on the warm blood of humans. Roger, Peter and Stephen leave the mall to get some semi trucks and block the entrances. Roger is nearly attacked and almost starts to lose it when the blood of a zombie is splattered all over him. He forgets his bag in another truck and has Peter drive him back for it. Unfortunately, this time Peter is not so lucky...he gets bitten in his arm and has a chunk of his leg eaten off. The others wrap his wounds in bandages, before stocking up on weapons and ammunition. They proceed to block the exits to the shopping center to keep any more zombies from getting in. Peter and Stephen then slowly gather the dead ones and put them in freezer rooms. Roger is led around in a wagon and is looking sicker...while the other three seem to be enjoying themselves with everything the mall has to offer. They take money from a bank, eat as much food as they want - and play at the arcade, among other things. As he watched the scientist on TV say that bombs should be dropped on all major cities, Peter notices that Roger has completely transformed into a zombie and shoots him in the head. Peter, Francine and Stephen solemnly bury their friend under a plant. Time passes and Francine's pregnancy begins to show. She spends her time in an "apartment" she and the other two have set up...while a large group of the undead remain on the outside of the mall. As Stephen teaches his girlfriend how to fly the helicopter, they're unaware that a posse of motorcycle raiders (one is played by Tom Savini), are watching and planning to invade the shopping center. Later in the evening, they do just that. Francine, Peter and Stephen are unable to keep the bikers AND zombies out. There is a wild frenzy of looting by the bikers...and open warfare between them, the zombies and the three friends. Stephen is shot in the arm while trying to get back to the hideaway. As he attempts to make it up to the elevator shaft, zombies enter the elevator and grab him. Huge bites are taken out of the poor guy. Stephen doesn't answer Francine's radio call so she tells Peter they should leave. But Stephen does indeed show up, undead and with other zombies in tow. Peter shoots him in the head and orders Francine to get to the helicopter. He plans to stay behind and distract the zombies away from her. Dawn of the Dead ends on a relatively positive note. A scary premise, terrific make-up and special effects...and a literate, dark humored screenplay that takes aim at consumerism, make this classic a must-see. The carnage is breathtaking. Romero said he wanted the movie to have a numbing affect. He calls Dawn a "filmic pie in the face." Dario Argento put out his own cut of Dawn of the Dead for European audiences and retitled it Zombi. It was released overseas in 1978, months before audiences in the United States were able to see it. The international version was almost ten minutes shorter. Its pace was faster and some expository sequences were removed...but it also contained numerous scene extensions and addtional music from Goblin. For obvious reasons, the film ran into trouble with the American ratings board and cuts were demanded in order to avoid an "X" rating. Romero and his distributor decided instead to release the film without any rating. Were the gory special make-up effects fully scripted? Tom Savini had this to say: "George (Romero) is terrifically organized. He put all the scenes in Dawn of the Dead down on index cards, so that when you spread them out, you had the whole movie spread out before you. And those scenes all overlapped, so that if you removed one, part of the puzzle was missing. That's by way of saying, yes...Dawn of the Dead's grisliness was definitely in the script. We did improvise some of the stuff, but well over fifty percent of it was in George's script beforehand." The majority of the production was shot in an actual mall in Monroe, Pennsylvania. To build a set of this magnitude would have cost millions...but the filmmakers were able to secure usage because they had a contact on the shopping center's Board of Directors. Director Romero would follow this up with yet another sequel in 1985, the less successful Day of the Dead.